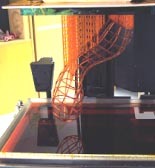 Two different techniques of prototyping were considered in the manufacture of the structure to achieve the best results; Fused Deposition Modelling (FDM) technique and the Stereolithography Apparatus (SLA) technique. 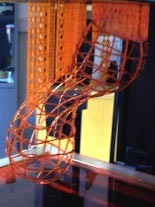 The main problem with the FDM technique was the difficulty experienced in generating the support model. Thus the SLA technique was used. In order to do this the size of the elements had to be changed to 1mm. This was because of the minimum thickness that can be successfully manufactured by the SLA machine is 0.5mm and it was deemed wise to have some comfort on this minimum dimension. 1 In the SLA technique the system creates a platform from which the 3D model must be oriented and positioned. The physical part is built on a base platform of a glass plate. This corresponds to the digital representation in the software and is referred to as the build bed. 2Specific areas of the model require physical support during the build process. The model is built by a repeat process of the glass bed dipping into liquid resin then extruding vertically for the resin layer to be cured by ultra violet laser light. Material supports are required to hold the model to the platform bed and to physically support and hold the structure during vertical build. 3 Figures 1 and 2 illustrate the SLA prototype model upon completion of the manufacturing process. 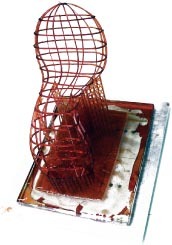 With the model part having been grown layer by layer in the vat of liquid resin with the completed prototype model mounted upon the material support structure.